A Zazzle store Celebrating Monochrome Patterns and exploring the beauty of black and white. This week I’ve been researching stripes. I’ve finally finished gathering some info so I’ll start posting my findings over the next few weeks. For starters here is the History of Stripes in Bullet form. Long, long ago watermelons, tigers and zebras adopted stripes. Cheetahs considered stripes but decided to go for dots instead. During Medieval times (5th to 15th century), prisoners, clowns, prostitutes and all things evil in Europe were forced to wear stripes so that they stood out from the crowd. People wearing stripes were executed (why were stripes evil? check out this article here). By the 15th century the image of stripes was getting better and stripes started being used for uniforms both civil and military. In the 18th century, the American revolution and French revolution kick off. Both stripy flags are waved in battle and suddenly stripes become a symbol of revolution and romanticism. The American Flag is waved after battle. A symbol of revolution. In mid 19th century France introduces the 21 navy blue striped (one stripe for each of Napoleon’s victories) Breton shirt for its Navy uniform (good article on this here). Stripes are used so that Sailors are easier to spot in the sea. At this time prison uniforms are also striped to make it harder for them to blend in with the public if they were to escape. Early 20th century stripes start to become fashionable after Coco Chanel is inspired by the French Navy’s uniforms. Coco Chanel releases stripes in her 1917 nautical collection. Coco Chanel wearing stripes and trousers. 20th century striped shirts are picked up by icons such as Pablo Picasso, Marilyn Monroe and Audrey Hepburn. Stripes kick off. Stripes are also used for Zebra crossings in the hope of reducing car accidents. Marilyn monroe in striped dress. Pablo Picasso wearing striped shirt. 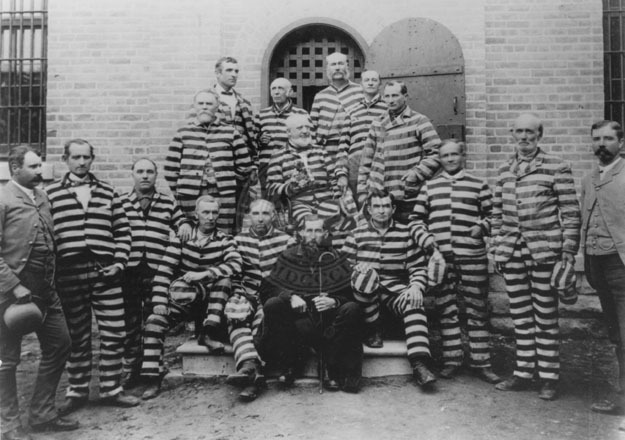 Mid 20th century, striped prison uniforms are deemed undesirable due to their continued use as a ‘badge of shame’. Their use is discontinued and prisoners start dressing up as oranges instead (more info on prisoner’s uniform here ). 1986 Martin Handford hides Wally (or Waldo if you’re in the US). Kids all around the world spend hours looking for him whilst parents enjoy moments of peace and quiet. People with glasses can no longer wear red and white stripes from fear of being spotted and called Wally. Present day, stripes go in and out of fashion but are always around in interior design, fashion and practical use (ie. warning signs, barcodes). Most of the info and images have been sourced from these articles I found. They are definitely worth a read if your looking for more info. Easy to read article from harper and lewis vintage blog on the history of stripes. Hope that info was useful! If you though it was, please let me know by liking this post or following me. 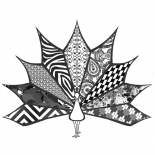 If you have any time to spare please also check out my monochrome pattern designs on my Zazzle store, Printapattern. Great post – love the zebra references! Thanks for including Goutaste in your source list! You’re welcome Emily. I enjoyed reading your post on how the French got their stripes. This entry was posted on May 30, 2014 by Printapattern in Pattern Bank and tagged breton, design, fashion, history, Patterns, stripes.